The above info suggests we’ll get Bros’ Drop The Boy and Kool and the Gang with Brother Louie. What will Madness play? At first I thought Our House, But maybe it’ll be Uncle Sam or even My Girl!! We Like Daren’s thinking, and we wonder if Uncle Sam from Razzamatazz has been unearthed? Fingers crossed. Both King, Eddie Grant, Annie Lennox and Spandau Ballet have had footage from that ITV shown in a recent episode of this Pop Gold, though Channel 4 show, The Tube, does feature in this recap clip series. It’s narrated by Andy Kershaw and is very much like a Top of The Pops 2 format where trivia banners are placed over the clips. The much seen Our House Tube clip would be fun but much less interesting to see again as it’s already on Youtube. Now, on with this week’s egg-cellent issue. 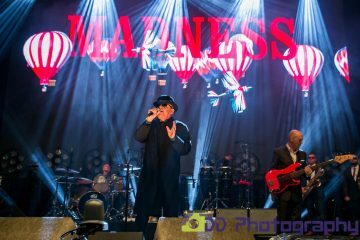 March 12th – The Emirates Stadium – This week “The Gig Company” has announced Madness appearing at Suggs & Friends charity event in the line up (see below). 14th Shepard’s Bush Hall London. W12. A 1,000 copy limited edition 7” of ‘Lovestruck’, which has never been available on vinyl, backed with ‘Le Grand Pantalon’, best known for its use in a 2011 Kronenbourg TV ad, and which is also making its vinyl debut. Comes with a unique insert, a ‘Madness Presents’ 3D ‘Love Struck’ Toy Theatre, a replica of a classic Punch & Judy puppet theatre. In addition to iconic London characters like a Pearly King and Queen and Punch & Judy themselves, the interior of the 3D theatre features depictions of items and characters relating to Madness and their songs, including pith-helmeted soldiers (‘Night Boat’), bottles of Madness Brewing Company beer, a rollercoaster (‘House Of Fun’), terraced houses (’Our House’), and many more. The character collage was created by Peter Quinnell, and the toy theatre is being manufactured by Benjamin Pollock’s Toy Shop. ‘Lovestruck’ has been re-mastered for its vinyl debut from the original ½” tapes. There are laurel leaf official polo’s in white, navy and black. T-shirts for all three beers; Night Boat, Lovestruck and Gladness. There are black laurel Beanie hats with the M crown logo, a new royal logo like Fez for gigs, blue and charcoal House Of Fun T-Shirts and a Mad Head design mug. The black and red Dangermen Vs Invaders shirts are brilliant; half designed on the original 2004 Dangermen poster look with added flying saucers, making a really nice retro feel to the whole design. There is a blue Madhead Picture T-shirt with a slogan on, and some Oui, Oui, Si, Si merchandise still available. Clive Langer revisits Shipbuilding, his legendary track with Robert Wyatt and 3 other new Langer group songs. A Comfortable Man – Cathal Smyth solo album. Signed Packages Now Available. Remaining limited LP’s, CD and download. Album available May 11th. Signed Super Deluxe Bundles are now available, containing the Limited LP, CD and download editions. The preview track and single download instantly, and you also get a pack of 10 art postcards. The album is available in a Digipack CD with 8 page booklet. If you attended the Wilton’s music hall gig and already have the LP, or if you are only interested in certain items there are a range of other buy options available. Signed CD’s separately. Etc. Do You Belive In Love – Cathal Smyth solo single. Do you believe in Love? Why wouldn’t you? What would our worlds be like without love? I simply couldn’t bear it? Could you? To begin, ‘Do You Believe In Love?’ is to be the first single from the album. In Your Mind – Woody Woodgate solo album. (website **Now live**. Details to follow) 13 tracks with new band line up and vocalist Dan Shears. “In England alone there are probably 20 more festivals than there were when we began. You are playing to audiences who are there not just to see you. So through that we have managed to accrue a whole new generation by playing 40 or 50 festivals over the past 5 years. It’s been very flattering and marvellous to see so many different age groups enjoying the band. We are looking forward to this on the tour – people of all ages. I think the reason we endure is that we genuinely do enjoy ourselves. From the very beginning you could see the joy in the early videos we made and hear it in the records. The fact that we were friends before this band started is key. Suggs talks to Robert Elms about his Mum hanging with Tornado Jones. Pancreatic Cancer charity. Sabbaticals from Madness. His next one Man Show might be about the history of Pop music, for 2016. From Music Hall and music of the street, and folk stuff, through to his influences. And laugh at the possibility of his taking over from Clarkson. But he says he’s never driven over 30mph. It began with Rob Kaisimier over on “The Madness” group page on facebook who claimed that Salvo would be releasing that missing “THE” album on the morrow of the 1st. Next, over at “All Things Madness” they hosted this years MIS prank. We ran a competition claiming there was going to be a Grandslam warm up gig continuing the theme of sporting venues it would take place at the National Tiddly Winks Stadium in Cambridge. No such gig or venue of such size for a tiddly sport exsists of course. It’s much smaller than that. But the promise of free tickets fooled a near hundred into the replying with the required response which was to obtain the “unbelievable total wink Madness prize”. All you had to do was reply with “WINK”, and choose 3 numbers. A load of wink ensued. Sometimes even those calling out the date still then added a wink to win. Nudge, nudge say no more! Most bizarre of all, only a few week backs we got some spam like approach from a wine seller who contacted us in response to last years Magic Brothers Beer, wanting to sell us themed corkscrews. Although there wasn’t too much going on with the band that was public knowledge we’ve still had a packed issue for you. First-up, and Chris and Emma brought news of the latest offers from Retro Madness. With the Our House Musical being staged at a number of venues up and down the country they decided to coincide their price reductions with items from the original theatre run. 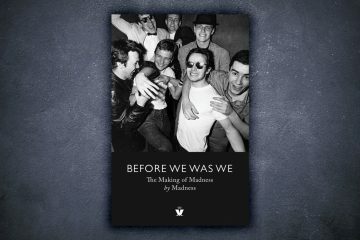 Elsewhere, we had an article from the This Is Somerset.co.uk web site, reporting on Madness’ forthcoming appearance at this year’s Glastonbury Abbey Extravaganza, and if that wasn’t enough, we brought you news from The Guardian, who revealed plans of a new Specials album in the pipeline. Alongside that little lot we also took our regular lookbacks when we went back 5 and 10 years in our regular That Was The Week That Was article, and brought this issue to a close with the news that on the previous Wednesday, Suggs and Sir Cliff appeared on BBC Radio Merseyside to talk about the forthcoming Everyman fundraiser to commemorate the life of band member Eric Shark who passed away on the 7th of January. Suggs talked about the band’s influence on music and there was also discussion about the songs he might sing! 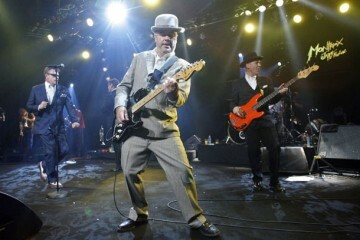 We started off this week’s issue with a massive review by Jonathan Young following Crunch’s recent gig at The 100 Club. The band performed an 18-track set, with 2 extra tracks for an encore. Supported by Jag and Stiff Naked Fools, Jon commented that both were excellent, and that it was a fantastic gig and a top night. Moving on, we took a look at the ever-growing archive section of the MIS web site. We’d now added another 3 gigs to our audio section, and a couple of bootleg DVD rips to our video download section. The main purposes of the MIS downloads section were to give fans access to hard to find audio and video recordings, and at the same time stop the pesky bootlegger from making money. After all, why pay for an unofficial recording when you could download it from the MIS site for free? With things being a little quiet we decided to look at a new Ska / Reggae album that had recently gone on sale over at 101cd.com. Entitled “Original Reggae / Ska Album”, this 20 track CD featured some absolute classics, and at a mere £5.99 was a total bargain. We then passed things over to Steve Bringe as he cleared things up regarding “How well Madness releases did in the US”. Steve listed both album and single releases, detailing the peak position and number of weeks in the chart – all essential reading for the Madness stat anorak out there. 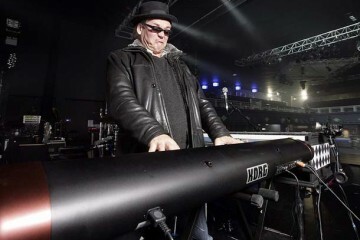 We started off this issue with the sad news that Ian Dury had passed away on the 27th March. Almost as soon as the news was announced on UK television and daily newspapers, words of tributes began flooding onto `The Total Madness Mailing List`. Many people just trying to put their thoughts into words, whith others letting us all know just what made `Uncle` Ian such a great man, giving us all `reasons to be cheerful`. Meanwhile, the TMML’s Simesy had been in touch with Martina at the Cancer Bacup Charity which Ian Dury pledged his support. Simsey gave us details of how you could all donate to this more than worthwhile cause. “Ian was a truly remarkable person who has helped our charity in so many ways – primarily by just being himself – a very warm and caring individual. He will be greatly missed by all in CancerBACUP, especially those who have worked with him on so many occasions over the past few years”. 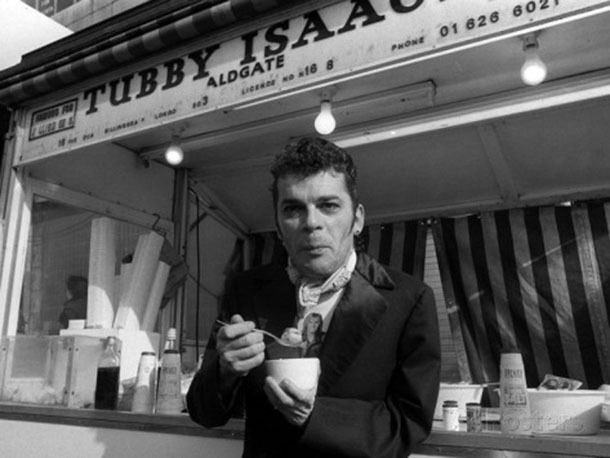 The BBC re-ran the excellent Ian Dury documentary to mark his passing. “BBC2 are just after showing a replay of the wonderful insight into Dury. What was significant though was a very humble and sincere forward from Suggs. In a denim jacket, the man himself paid tribute to Ian and said that he was an inspiration. 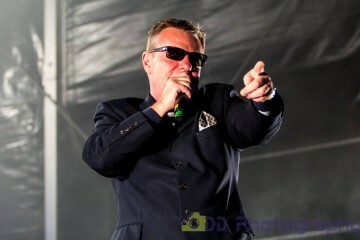 Singing in his own accent, speaking about things he knew inspired Suggs to write his first proper song ‘Baggy Trousers’. 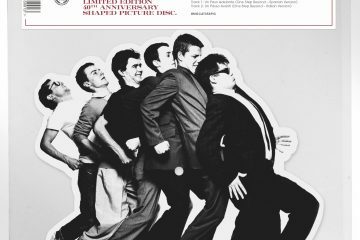 “London’s Design Museum is going to play host to an exhibition of Doc Martens boots, including one pair signed by Madness. The exhibition is on from March 30th till May 8th”. Remember the Madness documentary that the BBC had been putting together as part of the `Young Guns` series? Well, Chris Carter-Pegg reported that the date of airing had been put back again. The show now looked likely to see the light of day around September. “Madstock 5 is closer than ever. The Mean Fiddler have just booked the Fleadh @ Finsbury Park for the 10th No ugly roomer…… Madstock 2000 is on it’s way …Sunday 11th June 2000. Wait and see.. tickets should go on sale within a week”. 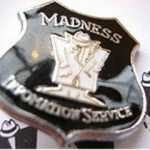 Last week Scatty announced he was trying to organise the world’s very first Madness convention. He had ideas, and a pencilled-in date. All he needed was some feedback and some support. Well, since last week Scatty reported that, “I have had nothing but help & interest from so many people”. Since the unfortunate passing of Ian Dury, Scatty had decided that this would be a charity event, with all proceeds going to the ever so worthwhile Cancer Bacup. The date of the event had now changed to Saturday the 10th of June. Yes, the day before Madstock 5. 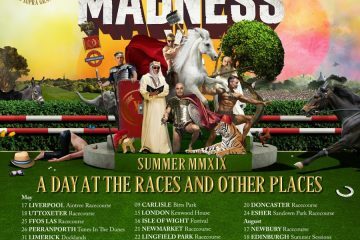 Scatty was currently in touch with a support band, and was also on the look-out for people to set up stalls selling Madness and Madness related merchandise. To cover any costs, tickets would be on sale for the event, but a price had yet to be finalised. Scatty also told us that a website should be up and running within the next week or so with contact information, details of what was planned, and accommodation details as well. With the sad news of Ian Dury’s departure, this issue had a number of Dury related articles throughout the usual Madness related news and information. Vince Foley returned with a wonderful tribute to Ian and puts into words what we’ve all been feeling over this past week. There was also a small selection of some of the best articles to appear since Ian’s sad death for those of you who didn’t manage to catch them when they were first published. Elsewhere, and Total Madness Mailing List subscriber, Colin Galbraith gave us a review of George Marshall’s excellent Madness book, `Total Madness`, Wozza revealed that a new promo CD was currently doing the rounds and that a world tour may be on the cards, and Peter Gardner reported on what tracks may be appearing on this re-mastered version of Divine Madness. In this week’s Live and Intensified we pass the reigns over to Mark Adamson. Mark brings us a review of the recent Clang Group gig, which took place in Soho on the 27th March. 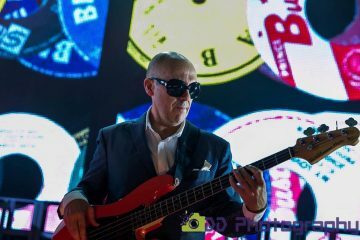 The Clang Group, led by Madness producer Clive Langer, played just its fifth gig on Friday night, performing an excellent set at Blow Up at the St Moritz Club in Wardour St. Playing mainly new Langer-penned songs and a few from the back catalogue of The Boxes, the band opened with the evocative and eccentric Concertina and then straight into Splash, before slowing in to the beautifully melancholic Heaven, a song about the tragic death of Robb Skipper of The Holloways. You soon see why Langer’s style has been compared by those that know to the late and wonderful Syd Barrett. The four songs from the band’s new Domino Records EP follow – three new songs including the single Rhoda, which has been getting good airplay, plus Shipbuilding (Langer’s iconic collaboration with Elvis Costello). The set is performed with energy and great skill. Langer’s angry guitar is blended with Andy Mackay’s saxophones, the Roxy Music man playing superbly with strength and wistfulness in equal measure. Gregg Braden’s powerful drums and Malcolm Lunan’s bass drive the band along, with John Wood on keyboards bringing further colour and humour. More Langer songs old and new bring us to the end of the set where the band is joined by Suggs on vocals for Mackay’s Love is the Drug, the band finishing on yet another high. The atmospheric and intimate cellar venue worked well for the band who now move on to a gig at Surya in Kings Cross on 23 April. If you can get there we’d recommend it – this is a band that is just at the start of something that is already really very good. A thread over on “All Things Madness” this week drew comment from Chrissy Boy. Before we go we bring this issue to a close with a small update for this November’s House of Fun Weekend. This week the Centre Stage line-up was announced, and we’re pleased to report that Craig Charles is back. Not only that, but this year he’s curating the entire Sunday Night in Centre Stage. Geno Washington. Tiro Lark, The Ram Jam Band and band New Street Adventure join him. Friday plays host to the Cuban Brothers again, alongside The Dub Pistols, & Norman Jay MBE. 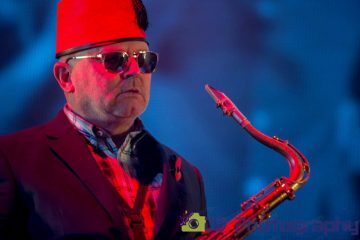 On Saturday David Rodigan helms the night, with Shy FX, Gentleman’s Dub Club, and Prince Fatty, the excellent ska and reggae producer renowned around these parts for Producing Lee Thompson Ska album, moving up from Reds into the main stage, too. There’s plenty more to announce later in the year for this forthcoming November spectacular.